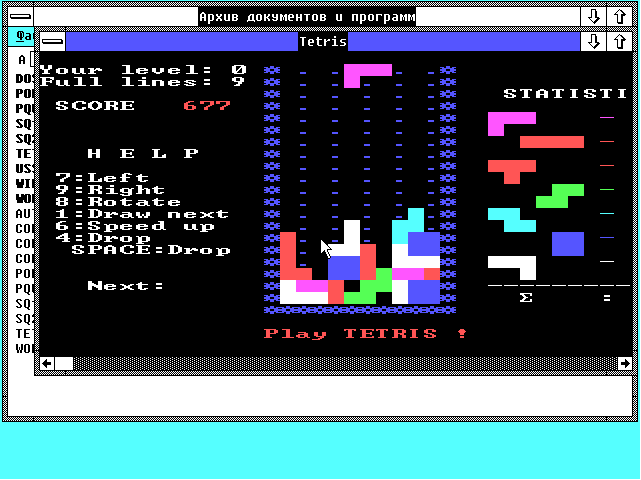 Well for some reason I was interested in Tetris (Тетрис), and wanted to find an early version. 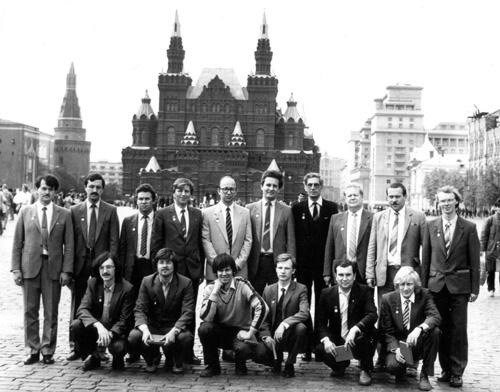 Looking around I did manage to find some background by Vadim Gerasimov, on the whole origin of Tetris. What I never realized is that the first version was written for a Soviet PDP-11 clone, then ported to the IBM PC using Turbo Pascal! Or that it was all done in text mode! The thought at the time is that every PC could run 40 colum mode, and thus would run Tetris. Along the way I did manage to find some other early Russian artifacts for the IBM PC, namely MS-DOS 4.01 which not only has its own site, but has an excellent view into the history of localizing MS-DOS, and what the culture was like at the time. There is even a promo video in Russian of course..
And I did come across a ‘Перевод’ of Windows 2.1 done in 1990, but no luck on Windows 3.0 .. I wonder if they ever had OS/2 1.x ..? Which speaking of non english versions of OS/2 1.x seem non existent, but I did find reference to there being a release in Japan, but naturally not even a screen shot.. I did find one rather harsh review of Windows/286 2.1 (Pусский), but seeing as far as I can tell there was no Excel 2 or Word 1 for Windows in Russian it would have been pointless running it back then.. Unless you had the 386 version! While looking around again for more DEMOS stuff (not to be confused with ‘demo’ argh!) I found Serge Vakulenko’s ready to run DEMOS 3.0 for the PDP-11/SIMH package! And I think this is the corresponding source code. More information can be found on what I think is Serge’s blog. Now on to running it. The good news is that I only needed msvcrt.dll from Visual C++ 4.0 to get it to run under Windows 95.. The ‘bad’ news well for me is that I couldn’t think of a good telnet to do Cyrillic/KOI8-R properly. I’ll admit it’s probably me not knowing how to do it correctly. At the same time, I figured the ‘easy’ way out is to just install some Russian version of Windows. Naturally there is the ‘dual keyboard’ layout thing in Windows, which if you can’t read the default language… well. it’s too intimidating. But with enough mousing around I pulled the Russian keyboard out and it seems to operate fine. There is of course some information here, but the mechanical translation is rought.. The wiki page still talks of 68020 and VAX ports of Demos (among others) I wonder if they’ll ever surface? I’ve even found comprehensive documentation for both Демос and Xenix of all things here. And to round things off, here is a mechanical translation (thanks google!) of the readme…. – Set up the system files. administrative functions in the DEMOS.  – Duplicate the distribution set GMD. destroy information on floppy disks. should be without a marker. presses of the program is configured rwset. SM 6900, ROBOTRON SM 6329, D100, D100M, etc. 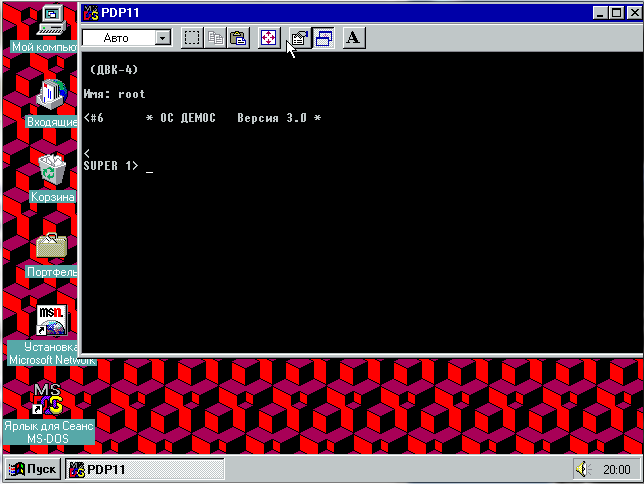 driver software is configured lpset. For details, see READ_LP file in the root directory. KR18101RE2-182, operating in 8-bit character mode. e). Number of I / O buffer. f). Number of processes in the system. g). 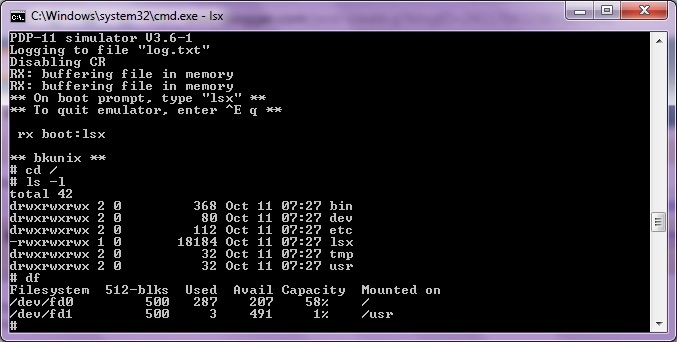 Number of concurrently executable programs. h). Number of file descriptors. i). Number of simultaneously open files. pumping at boot time, for the teams. k). Reduced the number of overlay core demos. work on different types of hard drives. a). (PF1) (i) (VC) set / reset insert mode. b). (PF1) (b) (VC) set the 132 characters on the screen. c). (PF1) (l) (VC) set the 80 characters on the screen. e). (PF1) (^ 0) set / reset mode drawing / erasing pseudographics. f). (PF1) (n) (VC) Exit from the pseudo-graphic. g). (F1) move the cursor on the word forward. h). (PF4) move the cursor to end of line. i). (F5) delete word to the right of the cursor. in the right extreme position of the current window. in the leftmost position of the current window. the upper extreme position of the current window. the lower extreme position of the current window. where the number has three digits. Corrected program graf (file etc / graf). Editor’s red boots, and other minor changes. (See above point 1), taking into account their different types and database RUBIN. (Associated with the programs of fsck, mount). READ_GRAF describes the graphics functions. exists at all, then the worker becomes a 152 cylinder. contained in a file READ_LP. 10 MB free disk space (the cylinder to 305 inclusive). After downloading the RT-11 operating system called DEMOS/306 team DEMOS. distribution N1-N5 are identical for both operating systems. OS DEMOS/306 – THIS IS A BREAKTHROUGH IN THE FUTURE! OS DEMOS/306 – just fantastic! executing / TEST / main. Files are generally accepted in the family of UNIX names. taking into account further developments. analogue of the “Norton Commander”. lab 462 / 2. All rights reserved. Somehow on my trying to remember how to enable scsi on the i386 qemu, I came across this fun project… Bkunix. No it’s *NOT* BURGER KING Unix… But rather a port of LSX-UNIX to the Soviet Elektronika BK computer. The BK’s were sold as personal computers in the Soviet Union, and were cloned from the DEC LSI PDP11’s. Later on, with the source being available, a project has been started by Sergey Vakulenko and Leonid Broukhis to port the LSX to the BK’s. What is neat about this, is that the entire system is built with a set of cross tools, to produce the kernel & userland utilities. And the best part is that you can run it in an emulator! You can download it here. Just don’t over expect the MINI & LSX UNIX’s were meant to run on tiny machines with as little as 40kb of ram. However given such a small constraint, it’s very impressive to see it in operation. And yes, the kernel is 18kb!